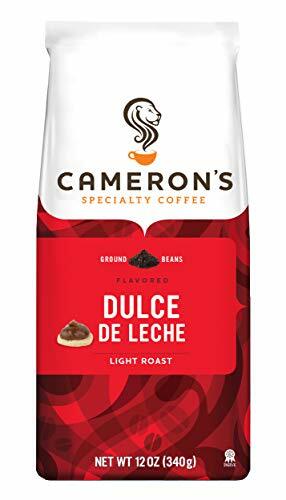 UNIQUELY HANDCRAFTED COFFEE: One, 12 ounce bag of Cameron's Dulce De Leche Blend. We craft Cameron's Coffee to be the smoothest, most flavorful coffee possible. Our coffee is sustainable, hand-crafted, and small-batch roasted. RICH AND FLAVORFUL: The sweet, rich cramaleized cream is a Latin American classic. Enjoy this treat in your coffee cup. SUSTAINABLY SOURCED: From roasting in small batches to reducing water consumption, Cameron's Coffee is committed to making every day brighter. Creating positive change mean caring about our coffee, farmers, and the environment. QUALITY FIRST: We choose only the top 10% of beans in the world, hand-crafted to perfection. Never over-roasted. If you enjoy Lavazza Coffee, Door County Coffee, Caribou Coffee, Death Wish Coffee, or Illy Coffee - try Cameron's Coffee. Final Price as low as $7.97 Shipped!